Marshall, Michigan - Thousands of mugs hang from the ceiling and walls of the tap room at the Dark Horse Brewery. Customers buy their own ceramic mugs, which they use every time they return. 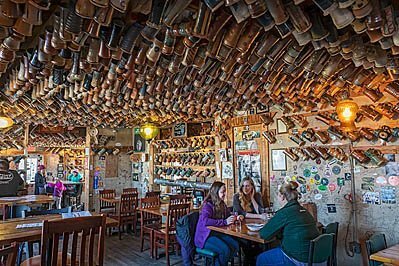 Image Description: Marshall, Michigan - Thousands of mugs hang from the ceiling and walls of the tap room at the Dark Horse Brewery. Customers buy their own ceramic mugs, which they use every time they return.